Project Hope after school club has come a long way with our relationship with the local Herndon police department. We remember day one when the students would not even talk or sit near the officers, to today when they truly understand and appreciate what police do for us. The students wanted to show the officers their true appreciation by putting together a survival pack for each officer. 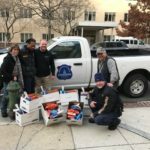 The pack included snacks and comfort items to help the police get through their day on the job. Giving snacks and drinks away that the kids love is a true feat for them…but they did it as they truly appreciate the officers! The students also showed their appreciation by making a banner that the officers will hang at the Police department. Two students Imanol and Jaqueline who attended the Code 3 hero award breakfast were able to share their experience of the ceremony with the other students. The students were impressed about the stories of the officers hurt in the line of duty and the also that senator Graham is trying to help officers. 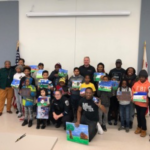 Later that morning Chief Deboard (Herndon Police) spent time with the students taking them to the memorial wall for fallen officers, the students were very moved and shared their experience with the other Project Hope students. The day was filled with mutual admiration for the children who gave and the officers who serve.